This first week of December certainly has flown by - arrived back in Michigan from my road trip to and from Corpus Christi, TX, and YES, I did the Horses on the Beach activity. Notes: It was fun, the guides Chester and Adrian were terrific, the other riders were nice, the day was lovely and one hour of horse back riding after many, many years was enough! When we reached the half way point down the beach, Chester offered to switch and give me his horse while he tried to get Cash used to the blowing foam. I didn't hesitate, but I must admit it made me feel a wee bit good when the horse tried to do the same thing to him. 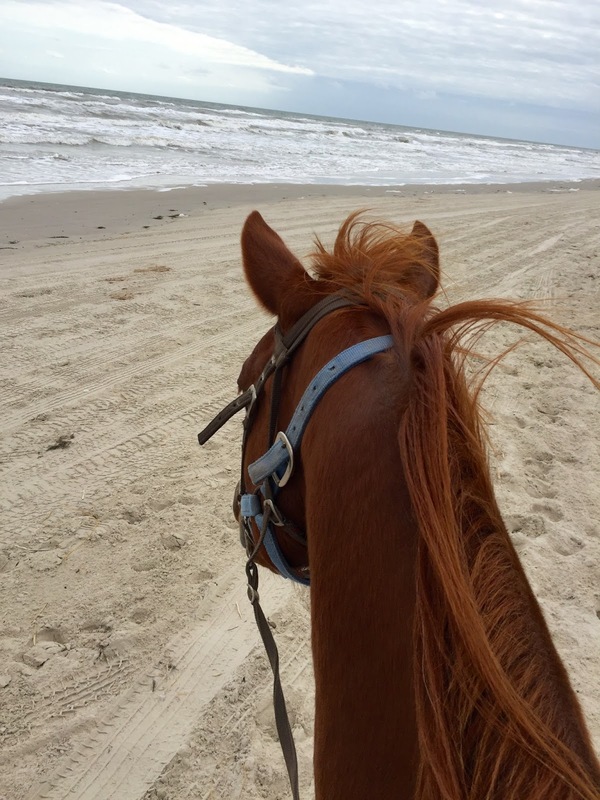 So I rode out to the beach on Cash, and rode back to the ranch on Fiona. I wasn't quite as sore as I thought I'd be the next day. Actually my back hurt worse after driving almost all the way back to Michigan in pouring rain --- talk about tension, whew! So, now it's time to get teaching proposals submitted, finish decorating the house for Christmas, design our Christmas card (yikes, I don't have much time! ), and get caught up with my Advent Bible Journaling. Of course there are lots of other activities with friends over the next few weeks! It's a busy but fulfilling time of year. The only bad part is that our daughter and her family won't be able to come home this year. Our town of Rochester is lit to the max - each storefront looks like a jeweled gift box - it's something to see! Tomorrow I will spend the afternoon/early evening in downtown Detroit for Noel Night activities - there are storefronts that are lit like the Rochester ones and so many people walking around enjoying all of the activities....carolers, bands, carriage rides, etc. It's all very special! May your December be filled with memorable events.